The huge fly-in at Oshkosh in nearly here and I’m planning to attend again. I’ve made it to this event for 13 out of the past 15 years, so this will be show #14 for me. I just never seem to get tired of it. I get a tremendous rush out of flying in there, meeting up with old friends, making new ones, and getting to see everything that is new (and old) in the world of Aviation. I’ll be camping out again, hopefully close to some of my friends, and I’m considering joining the mass arrival of Rutan-designed planes who will land just before the White Knight and Space Ship One. Harrison Ford will be there again, although I doubt he’ll be available for a sit down. There’ll be the usual assortment of astronauts and famous aircraft designers like Burt Rutan and famous pilots like Chuck Yeager. I think that the airplane toy market will be dominated this year by in-cockpit weather radar (XM satellite-based) along with cool GPS moving maps and EFIS displays. I’m so ready for in-cockpit weather radar. It seems that flying from Colorado to Wisconsin every summer usually results in skirting around or waiting out thunderstorms, much like the one in the top photo that I managed to skirt on the way back a few years ago. 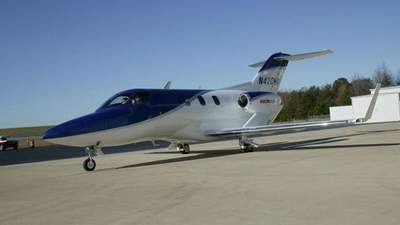 I’m also looking forward to seeing the HondaJet. HondaJet will make it’s first appearance this year. I suspect it will cost quite a bit more than a luxury Acura.